Fairfax Co., Va., Dec., 6, 1862. One or two noticeable events have broken the monotony of our camp life since I wrote you last. The first was the departure of three regiments of the brigade, which took place ten days ago. The order came at 8 o'clock in the evening, and the "bully Thirteenth," as its boys delight to call themselves, was on the march through our camp at nine, the Fourteenth and Fifteenth following with little delay. The Twelfth had orders to pack knapsacks and be in readiness to move at a moment's notice, and our own camp was all astir with the bustle of preparation. The night was dark and rainy, and as the other regiments passed on the double quick through our camp, their dark columns visible only by the light of the camp fires, our boys cheering them and they cheering lustily in response, the scene was not devoid of excitement. Every man in the ranks believed that such a sudden night march to the front meant immediate action, and the haste and hearty shouting showed that the prospect was a welcome one. The Twelfth would have gone with equal cheerfulness; but the expected order for us to fall in did not come. We have remained, doing picket duty with the Sixteenth. The service takes about all the effective men of each regiment, each going on for 48 hours. The marching to and from consumes the best part of another day, making in effect three days' hard duty out of every four. As the weather has been cold, and most of the boys get little sleep at night while out, they have found the duty pretty severe; but they take it for the most part without murmuring. The return of the other regiments, all three of which have come back to us, will, however, greatly lighten the service hereafter. Thanksgiving was the second "big thing" of the past fortnight. It was not quite what it would have been had the six or seven tons of good things sent to different companies from Vermont arrived in season; but it was emphatically a gay and festive time. The day was clear, air cool and bracing, sunshine bright and invigorating The boys of our company made some fun over their Thanksgiving breakfast of hard tack and cold beans, but possessed their souls in patience in view of the forthcoming feast of fat things, for we had heard that our boxes from home were at Alexandria, and the wagons had gone for them. At 10 o'clock the regiment assembled for service. Gov. Holbrook's proclamation was read by Chaplain Brastow, and was followed by an excellent Thanksgiving discourse. At its close, Col. Blunt addressed the regiment, expressing his thankfulness that he could see around him so many of his men in health; urging an orderly observance of the day; and inviting the men to meet the officers after dinner on the parade ground for an hour or two of social sport and enjoyment. An hour later the teams arrived with but four of the forty big boxes expected, and the unwelcome news that the rest would not reach Alexandria till the next day. Most of the companies were in the same predicament. Company I had a big box, and made a big dinner, setting the tables in the open air, to which they invited the field and staff officers. Two or three men of Company C received boxes, with as many roast turkeys, which they shared liberally with their comrades, so that a number of us had Thanksgiving fare, and feasted with good cheer and a thousand kind thoughts of the homes and friends we left behind us. We knew that they were thinking of us at the same time. If each thought of affection and good will had had visible wings, what a cloud of messengers would have darkened the air between Vermont and Virginia that day! At 2 o'clock, the regiment turned out on the parade ground. The colonel had procured a foot ball. Sides were arranged by the lieutenant colonel, and two or three royal games of foot ball--most manly of sports, and closest in its mimicry of actual warfare--were played. The lieutenant colonel, chaplain and other officers, mingled in the crowd; captains took rough-and-tumble overthrows from privates; shins were barked and ankles sprained; but all was given and taken in good part. Many joined in games of base ball; others formed rings and watched the friendly contests of the champion wrestlers of the difference companies; others laughed at the meanderings of some of their comrades, blindfolded by the colonel and set to walk at a mark. It was a "tall time" all round. Nor did it end with daylight. In the evening a floor of boards, laid upon the ground, furnished a ball room, of which the blue arch above was the canopy and the bright moon the chandelier. Company C turned out a violin, guitar and two flutes for an orchestra; some other company furnished another violin, and a grand Thanksgiving ball came off in style. I did not notice any satin slippers. The "light fantastic toe" was for the most part clad in "gunboats," as the men call the army shoes, and the nearest approach to crinoline was a light blue overcoat; but the list was danced through, from country dances to the lancers, and the gay assembly did not break up until half-past nine. So ended Thanksgiving day proper; but he enjoyment of the bigger portion of the creature comforts sent our company from Vermont is yet to come. Our Thanksgiving boxes came yesterday after the regiment had gone out on picket; and the few men left behind in camp have been sampling some of the more perishable articles, though booths of brush and picket fires almost extinguished by the snow, are hardly what one would choose as surroundings. 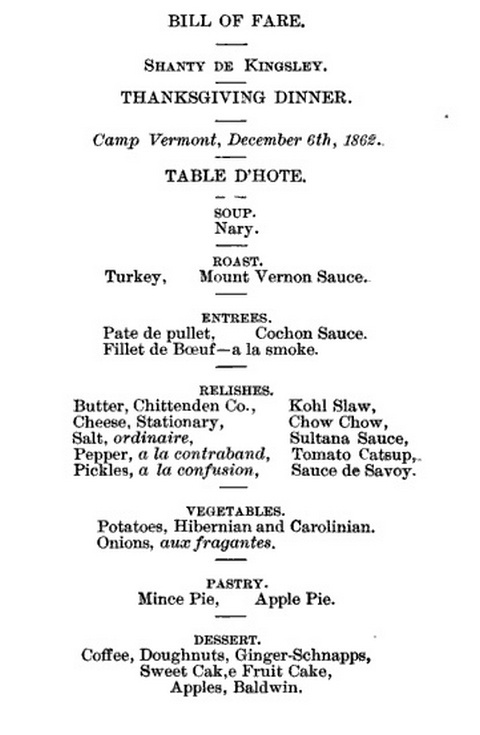 The Thanksgiving dinner of the officers' mess of Company C came off to-day, and was a highly select and recherché affair. The board was spread in the capacious log shanty of Maj. Kingsley and was graced by the presence of the amiable wife of Col. Blunt, who has been domiciled in camp for a week or two, and of the field and staff officers of the Twelfth and the chaplain and surgeon of the Fifteenth. I enclose a copy of the bill of fare, in the composition of which I suspect my editorial brother, of the quartermaster's department, had a hand. It was engrossed on brown wrapping paper, like the Southern newspapers, and everything on the bill was on the boards, sumptuous as it may seem. The good things said I do not feel at liberty to report. We have had our second snow storm. It began yesterday, and continued through a bitter night. Toward night the Thirteenth and Fourteenth regiments came in from Union Mills--the Fifteenth came in the night before--and marched into their deserted camps, close by us. They brought only shelter tents, and the prospect of camping down I the snow, with little food, no fuel, and scanty shelter, was a pretty black one for them, till our officers went over and offered the hospitalities of the Twelfth, which were gratefully accepted. The absence of most of our men o picket, left a good deal of vacant room in our tents, which were soon filled with wet and tired men of the other regiments. They went away this morning warmed, rested and fed. The weather to-day is very cold and I fear that our boys on picket will suffer to-night, though they will have frozen ground to lie on instead of muddy slush, which will be so far an improvement. The health of the regiment continues much better than the average of the brigade. We hear that General Stoughton will assume command to-day. The brigade would, however, I think, be satisfied to remain under command of Colonel Blunt. Thermometer only 15�above zero to-day.